Nate and I waved goodbye to city life this weekend and traveled to my small hometown for my uncle’s wedding. It was a quick overnight trip, but it was jam-packed! We stayed with my good friends, Chock and Kelly. I can’t say much about them without getting teary-eyed and gushing on and on about how much I miss them. I know I chose to move to the big city, but sometimes I long to play cards with Kelly all night long. I miss the hustle and bustle of their busy household. I miss the country kitchen. 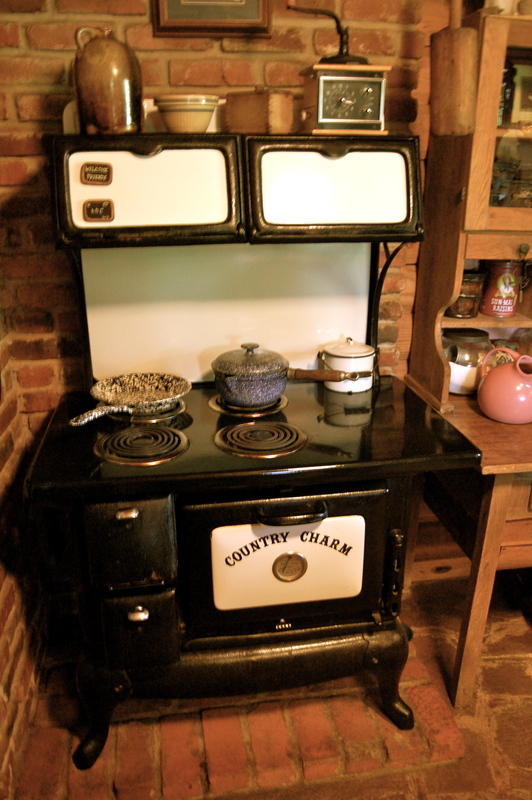 I particularly miss this stove. It has so much Country Charm it even says it on the front! This was Nate’s first trip to visit Kelly and Chock. We had a great time telling stories and catching up, but the time flew by really fast. Kelly also had a big renovation project going on, so I plan to go back sometime and take some pictures of their log house and all their western decor. Here’s one from the bunkhouse. 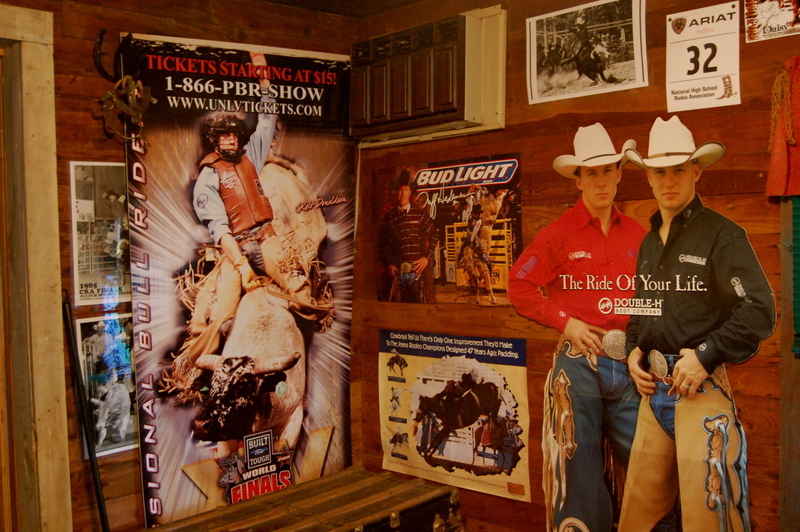 Chock and Kelly’s son Kolt is the rider on the big PBR poster on the left. As soon as we arrived on Saturday, Kelly started making Dog-Tired Dip. What’s really funny to me is that the name, DOG-TIRED DIP, really isn’t the name. Kelly wrote the recipe down on this cute little notepad. 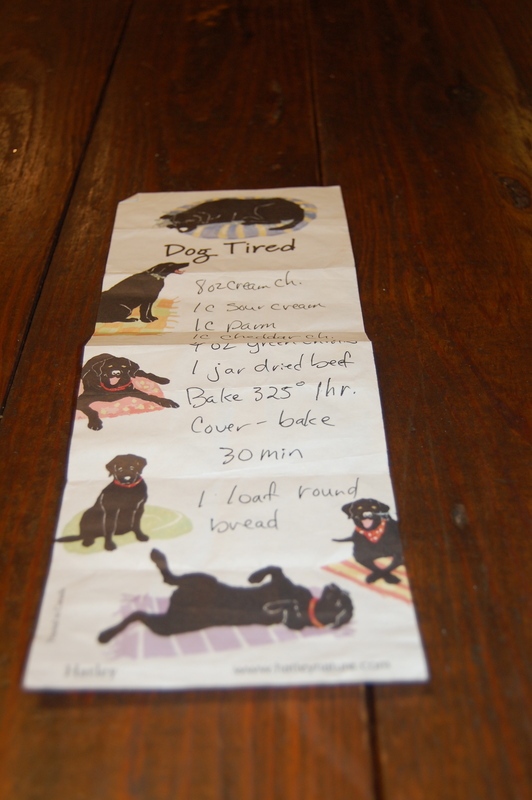 The paper said “Dog Tired” and she wrote the recipe right below. Her handwriting looks like the writing on the paper and so now it’s Dog-Tired Dip. It should have been called Dog-Gone Good Dip! It’s great. Mix together all these ingredients. Add them to a hollowed out bread round and sprinkle with red pepper. Bake on a sheet pan for 1 hour. 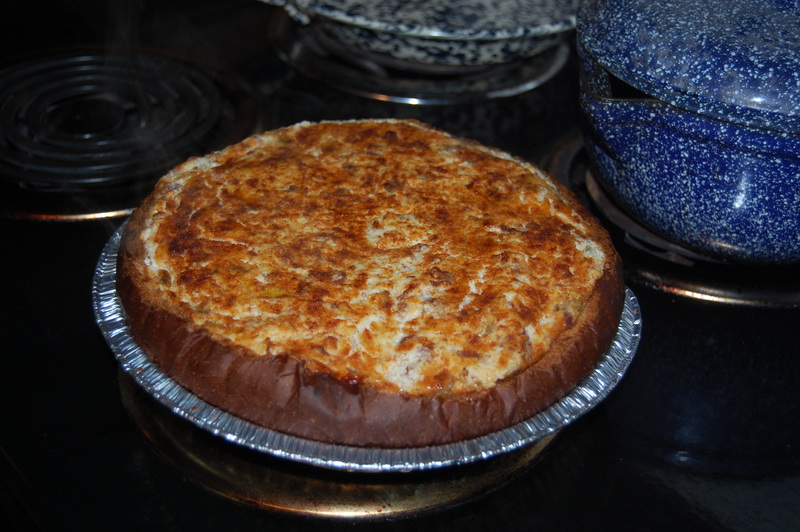 Cover with foil and bake an additional 30 minutes. Serve with chips and crackers. 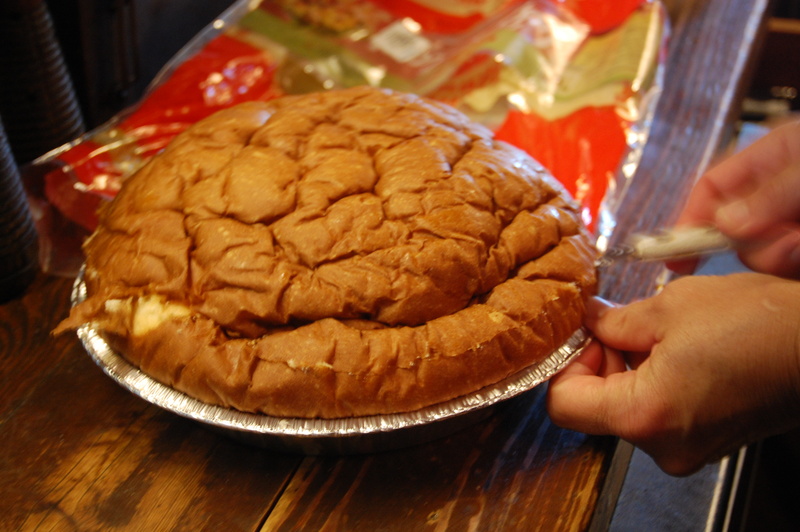 Just as this came out of the oven, we had a few bites and then drove to the wedding. 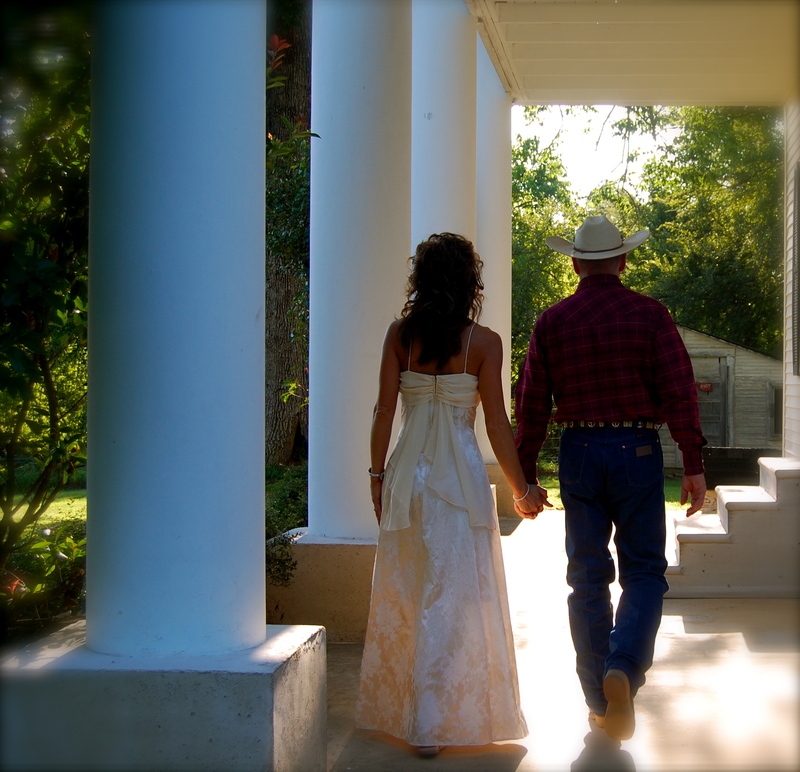 The wedding was beautiful. It was held on my Aunt Ann and Cousin Paula’s place just west of my hometown. They own what we always called the Old Watermill. The structure is gone now, but the scenery is just beautiful. 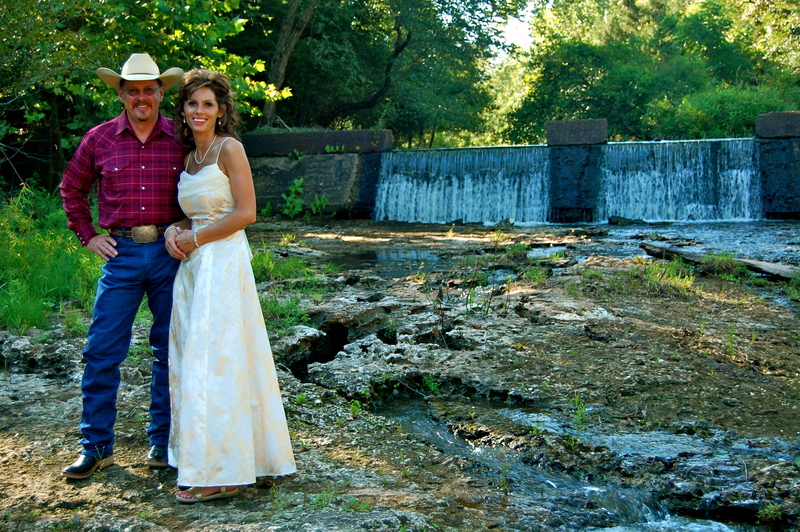 The location was around ½ mile from the Watermill Baptist Church where the reception was held. It’s always great to see so many family members gathered in one place. The spotlight was on these two – Floyd and Sherry. They are in love and it’s really nice to see such a perfectly suited couple. I wish them a long and happy life together. Other than wanting to thump her on the head for being so skinny and pretty, it was a perfect wedding. I didn’t dwell on her tiny waistline; I just had cake for dinner and took a bunch of pictures instead. We also took a few shots at my Cousin Paula’s house. Check out those columns! The house is around 100 years old and it reminds me of a real southern plantation. 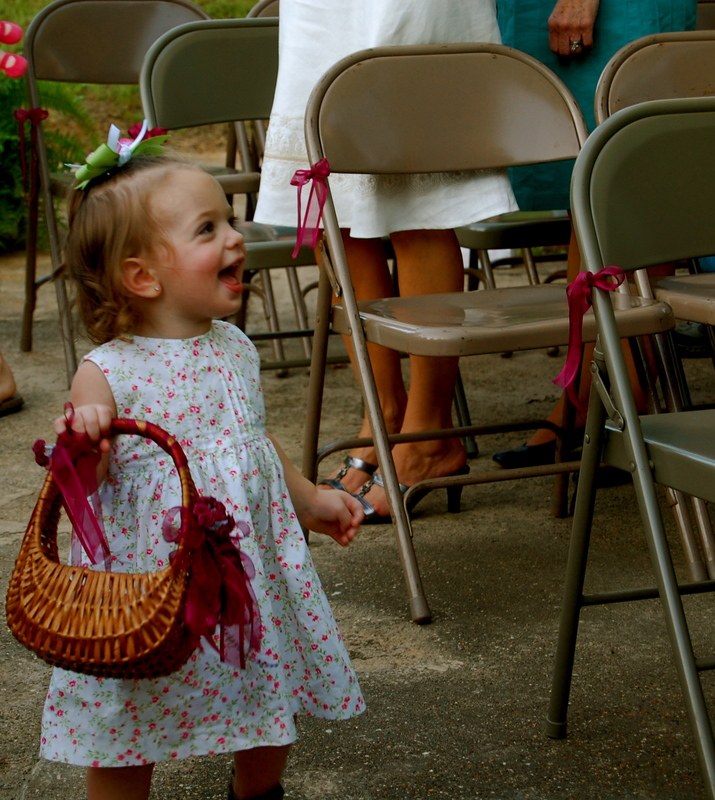 One thing I love about my hometown is this little angel – Izzy. She makes my heart melt. 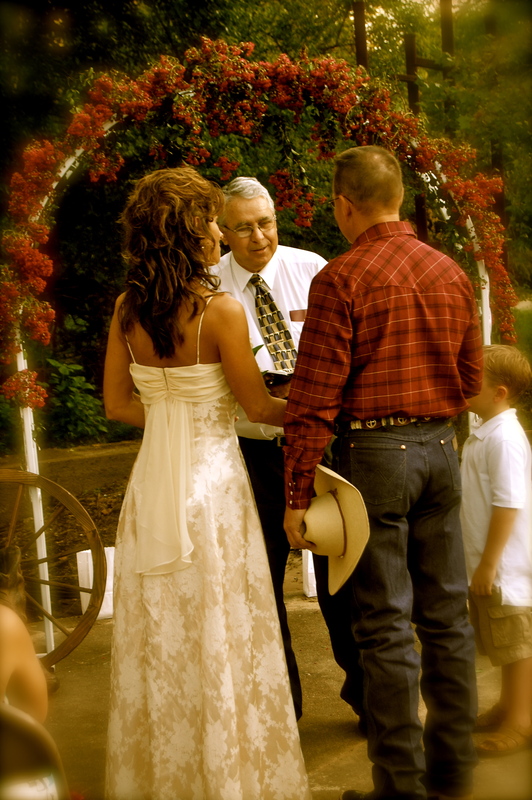 I also loved the fact that the preacher, Brother Bob, is great at performing marriage ceremonies. 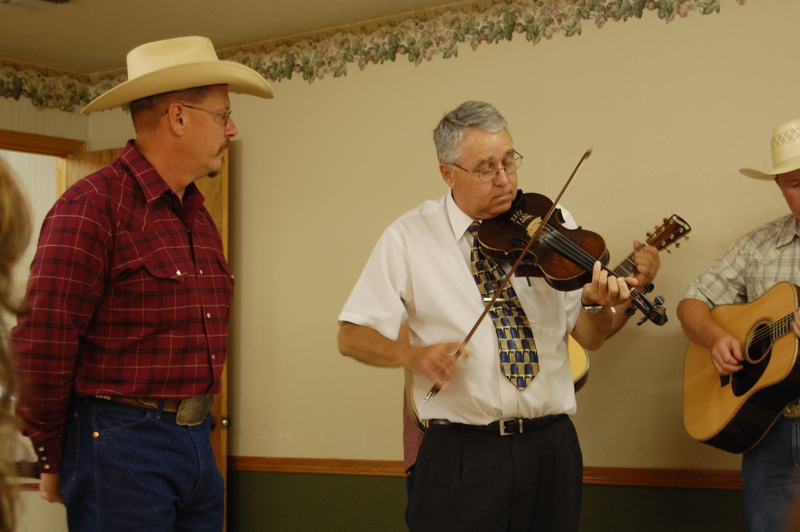 And, when the groom decides to serenade his beautiful bride, Brother Bob is great at backing him up on the fiddle. We finished the night off on a Quilt Tour, but I’m saving that for a blog of it’s own. I can tell you that Nate has been to my hometown many times and he still marvels that he continues to meet my family. He thinks I’ll run out of family members to introduce him to – I’m afraid he’s wrong.